Reflections on Christmas – Now that it’s over! For weeks we have been planning for Christmas. Looking for bargains, some even gave up their Thanksgiving evening to fight the crowds on “Black Friday.” Family recipes were pulled out of the drawer, decorations out of the basement or attic. Children were excited as they made out their Christmas wish list. Churches were busy planning special observations on Christmas Eve or Christmas morning. The day comes and goes. Busy adults breathe a sign of relief and begin the task of taking down the tree and its ornaments, putting all the decorations back in the basement or attic until next year. Children enjoy their new toys although some are probably already bored and ready for the next new toy on the market. School opens again and workers return to their jobs many complaining of how tired they are and how hectic the Christmas season has been. Grandparents are thankful for the memories they made with their families over the holiday but glad to get back to their quiet routine. Life goes on as always……has anything changed? Reading the Christmas story this year I was struck by the scripture in Luke where he tells of the shepherds’ visit to the stable where baby Jesus laid. The shepherds excitedly told Joseph and Mary about the visit of the angels and their message that the Messiah had been born that night in Bethlehem. Apparently they also told the people in the village. Luke tells us that all who heard their story were astonished. I can imagine that was quite an experience for the shepherds and the people in the village. They probably talked about that night for years to come, telling their children of the visit from the angels. No doubt there was many a discussion as to what happened to that child when his family suddenly left Bethlehem for Egypt. But was there any change? I wonder – did they search the scriptures to see what they had to say about the Messiah? Did they seek to know more of God? Or, was it just an exciting experience to talk about around the campfires at night as they continued to watch their sheep? When Jesus appeared on the scene almost 30 years later, did they question if he was the little babe born in Bethlehem? So today we make a big production of Christmas. You can always count on people saying “Keep Christ in Christmas” and complaining of those who say “Happy Holidays” instead of “Merry Christmas.” But what about keeping Christ in our lives all year long. What does saying “Merry Christmas” instead of “Happy Holidays” really do if we go back to our normal life after Christmas content that we “kept Christ in Christmas’? Did our reflection on the Christmas story make any difference in our day-to-day lives? Luke tells us that Mary “kept all these things in her heart and thought about them often.” This was not just an exciting night to be celebrated now and then. This was a daily part of Mary’s life. Can you imagine the sense of responsibility and great concern she felt that she and her husband were to raise the Son of God? Did she totally understand what that meant? And the words of Simon who told her a sword would pierce her own heart had to make her pause and wonder what the future would hold – for her – for Joseph – and especially for her son. Mary pondered – thought – on all these things. I wonder how much we ponder and think about the Christmas story and what it really means after the holiday is over. The Christmas story is old and well-known to us, but after the observation of Christmas is over, has it made any difference in our lives? First Christmas vs Our Christmas Now! Our Christmas cards show scenes of Mary and Joseph and Baby Jesus and they look so beautiful and so peaceful. Many of the cards show bright lights shining above the heads of Mary and Joseph and Baby Jesus. Even our Christmas carols speak of a lit tle baby who makes no crying. But how far from that first Christmas have we come? Was it really beautiful, calm and peaceful to Mary and Joseph and those who played a role in that first Christmas? And how would she face Joseph? He would know he was not the father. What would he say? Would he still marry her? Would he bring her before the community to be stoned? What about the child? Would gossip follow him as he played and grew in the village? Her decision was a matter of trust. She responded, “I am the Lord’s servant. May everything you have said about me come true.” Later Mary expressed how blessed she realized she was as she spoke to her cousin Elizabeth and said, ” “Oh, how my soul praises the Lord. How my spirit rejoices in God my Savior! For he took notice of his lowly servant girl, and from now on all generations will call me blessed. For the Mighty One is holy, and he has done great things for me. And what about Joseph? A simple carpenter engaged to a young woman in the village, Joseph no doubt was making plans for his soon-to-be bride and the family they would someday have. Looking forward with anticipation to their wedding, he is suddenly hit with the news that his future bride is pregnant. What sorrow he must have felt as he believed Mary had been unfaithful to him. What agony as he struggled with the decision he faced. Should he publicly denounce her – maybe even see her stoned? Should he, could he forgive her ? Although his heart was breaking, all his hopes and dreams were crushed, he was a godly and kind man. While no doubt Joseph rejoiced at this news, he had to have also been filled with thoughts of great apprehension. What a tremendous responsibility he was given – to raise the Son of God! Like Mary, he had to make a decision to totally trust God and welcome Emmanuel into his home. And then the journey to Bethlehem. How appropriate that the One who would say “I am Bread of Life” would be born in a city whose meaning is “house of bread.” And in Micah, 5 the prophet foretold that the Messiah would come from this small and insignificant town of Bethlehem. Luke tells us: “At that time the Roman emperor, Augustus, decreed that a census should be taken throughout the Roman Empire. (This was the first census taken when Quirinius was governor of Syria.) All returned to their own ancestral towns to register for this census. 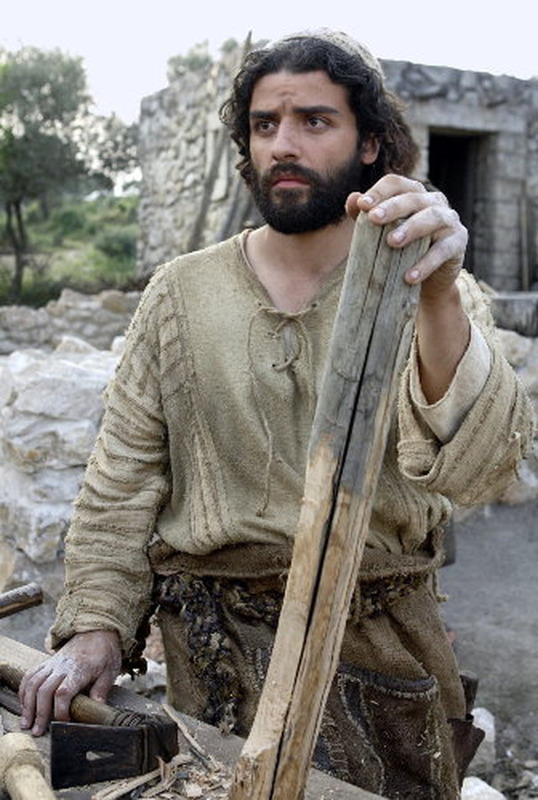 And because Joseph was a descendant of King David, he had to go to Bethlehem in Judea, David’s ancient home. He traveled there from the village of Nazareth in Galilee. He took with him Mary, his fiancée, who was now obviously pregnant. Imagine traveling 90 miles over unpaved, hilly trails with Mary in the late weeks of her pregnancy riding on a donkey and Joseph leading on foot. Bible scholars estimate that they would have probably only been able to make 10 miles a day because of Mary’s impending delivery. There could be threats of bandits along the trail. They had to carry their own provisions. The hardships did not end when they arrived in Bethlehem. We think of Mary and Joseph alone in the stable but it is possible that they shared that stable with others. In an overcrowded Bethlehem they were probably not the only ones who could find no room in the inn. And while they were there, the time came for her baby to be born. She gave birth to her first child, a son. She wrapped him snugly in strips of cloth and laid him in a manager, because there was no lodging available for them. And what of the shepherds? If you had been given the responsibility to announce the birth of the Messiah, who would you have chosen to tell? Would you have selected a group of people who spent most of their days in the fields with the sheep and had no influence with society? Shepherds were the blue-collar workers largely unnoticed by those in authority. That night there were shepherds staying in the fields nearby, guarding their flocks of sheep. Suddenly, an angel of the Lord appeared among them, and the radiance of the Lord’s glory surrounded them. They were terrified, but the angel reassured them. “Don’t be afraid!” he said. “I bring you good news that will bring great joy to all people. The Savior—yes, the Messiah, the Lord—has been born today in Bethlehem, the city of David! And you will recognize him by this sign: You will find a baby wrapped snugly in strips of cloth, lying in a manger.” When the angels had returned to heaven, the shepherds said to each other, “Let’s go to Bethlehem! Let’s see this thing that has happened, which the Lord has told us about.” They hurried to the village and found Mary and Joseph. And there was the baby, lying in the manger. 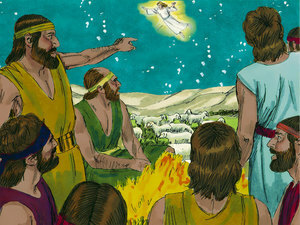 See the excitement with which the shepherds received this news and hurried to find the child. “About that time some wise men from eastern lands arrived in Jerusalem, asking, “Where is the newborn king of the Jews? We saw his star as it rose, and we have come to worship Him. King Herod was deeply disturbed when he heard this, as was everyone in Jerusalem. He called a meeting of the leading priests and teachers of religious law and asked, “Where is the Messiah supposed to be born?” “In Bethlehem in Judea,” they said, “for this is what the prophet wrote: ‘And you, O Bethlehem in the land of Judah, are not least among the ruling cities of Judah, for a ruler will come from you who will be the shepherd for my people Israel.’” After this interview the wise men went their way. And the star they had seen in the east guided them to Bethlehem. It went ahead of them and stopped over the place where the child was. When they saw the star, they were filled with joy! They entered the house and saw the child with his mother, Mary, and they bowed down and worshiped him. 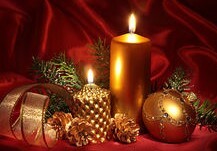 Then they opened their treasure chests and gave him gifts of gold, frankincense, and myrrh. The Wise Men traveled many miles to worship the King of the Jews. They did not hop a plane and arrive at Bethlehem in a few hours. They did not pack their SUV with food and drink and drive a few days across the interstate. Their journey required many days riding through the desert on the back of camels, stopping to sleep at night in their tents. It was not an easy journey, but they came eagerly seeking to worship the King. What is the real purpose of Christmas? Now we come to the real purpose of Christmas. The story of Christmas is only the beginning – unless it leads us to the cross and the empty tomb, it has lost its real purpose. Because of that obedience, God lifted him high and honored him far beyond anyone or anything, ever, so that all created beings in heaven and on earth—even those long ago dead and buried—will bow in worship before this Jesus Christ, and call out in praise that he is the Master of all, to the glorious honor of God the Father. First Christmas – and our Christmas now! That first Christmas required Mary and Joseph to totally trust God and accept His plans for their lives. To believe the words of the angel, Gabriel, and accept God’s will for their lives. This Christmas, are you trusting God, are you willing to accept His plans for your life? 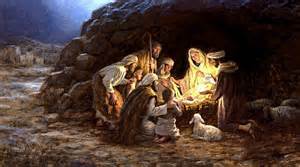 That first Christmas the shepherds received the good news of the child’s birth with great joy and hurried to find the child. Today is our excitement at Christmas more focused on the presents, the decorations, the meals, the parties? Are we still excited about the good news that “unto us a child is born, unto us a son is given: and the government shall be upon his shoulder: and his name shall be called Wonderful, Counselor, The mighty God, The everlasting Father, The Prince of Peace? 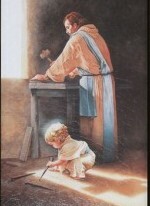 That first Christmas the leading priests and teachers knew the prophecy….knew God’s Word. Yet, they made no effort to go to Bethlehem to check out this story of the Messiah. The Wise Men traveled a great distance – but the religious leaders could not be bothered to travel the six miles from Jerusalem to Bethlehem. As we enjoy this Christmas season with all our decorations, food and gatherings with family and friends, let us be sure that we take time to really seek the Messiah. Let’s ask God to return us to the simple but awesome truth of that first Christmas in a dark, possibly cold, stable where two young people faced the awesome challenge of raising the Son of God without money, fame or lots of support simply trusting and obeying the Father. Christmas! What a magical time! We decorate our homes with trees, candles, wreaths. We put out a nativity set and hang up an angel or two. We plan gatherings with family and friends where there will be presents and lots of delicious food to eat. Everything is so neat and tidy – so beautiful. It’s truly a joyous time as we celebrate our Savior’s birth. Our Christmas cards show scenes of Mary and Joseph and Baby Jesus and they look so beautiful and so peaceful. Even our Christmas carols speak of a little baby who makes no crying and of a night where all is calm. But put yourself in Mary’s place for a moment. How frightening it would be to say, ‘Hey Mom and Dad, I’m pregnant but I’m still a virgin. This child I bear has been conceived by the Holy Spirit.” Can you imagine the response of her parents to that announcement? And how would she face Joseph? He would know he was not the father. What would he say? Certainly he would have questions. Would he still marry her? Would he bring her before the community to be stoned? Mary’s dream of marriage to Joseph and a wonderful life suddenly looked as if it would be shattered. How appropriate that the One who would say “I am Bread of Life” would be born in a city whose meaning is “house of bread.” And in Micah, 5 the prophet foretold that the Messiah would come from this small and insignificant town of Bethlehem. What a place to give birth! I can’t imagine giving birth in a cold stable with possibly no help in delivery except my husband who is a carpenter and maybe some strangers who offered help. To lay my new-born baby in a feeding trough for animals. Baby Jesus did not cry????? I find it hard to believe that baby Jesus just laid there quiet and calm. After all, the Bible tells us that He came to “be like us,” to understand our weakness and frailty. As He began His ministry, He experienced temptation just like us. We see Him falling asleep after an exhaustive day ministering to the multitudes. In the Garden of Gethsemane He cried out for deliverance from the cross. He felt the agony of feeling forsaken by the Father on the cross. One of the main points the writer of the book of Hebrews makes is that Jesus experienced human life as we know it, so why would He as a baby not have felt the cold, the hunger? Why would He not have cried as all new-born babies do? Enter the shepherds! Wake up Mary! Imagine Mary, worn out from giving birth, quieting her baby and watching Joseph tenderly lay him in the manger. Perhaps she thought about the visit from Gabriel and his words about this son she just gave birth to. Perhaps she wondered why, if this boy was the savior of the world, they were sleeping in a stable and he was laying in the place where animals took their meals. Finally, she leans back on the hay to try to get a little sleep when suddenly the stable is invaded by a group of shepherds straight from the hills where they had been tending their sheep. Pos sibly they did not smell all that pleasant. They no doubt were very excited and loudly proclaiming what they had seen and heard. As they shared the stories of the angels, no doubt Mary remembered her visit from Gabriel. What reassurance to know that others now had heard the wonderful message that this child was sent from God. 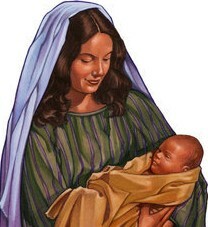 She and Joseph were not alone in knowing the wondrous news of this birth. Soon it was time to take the little baby to the temple and present the sacrifices required after giving birth. We can see from the gifts they brought of two turtledoves or two young pigeons that Mary and Joseph were among the poor of the land. Leviticus 12 tells us requirements for this offering. “These, then are the procedures after childbirth. But if she is too poor to bring a lamb, then she must bring two turtledoves or two young pigoens. Lord, now I can die content! For I have seen him as you promised me I would. I have seen the Savior you have given o the world. A sword shall pierce your soul, for this child shall be rejcted by many in Israel, and this to their undoing. But he will be the greatest joy of many others. And the deepest thoughts of many hearts shall be revealed. I am the Lord’s servant. May everything You say about me come true! Wishing someone a “Merry Christmas” – What does that really mean? Facebook is full of posts about saying “Merry Christmas” vs “Happy Holidays.” We go through this scenario every year. Christians judge people’s spirituality on what greeting they give and if anyone says “Happy Holidays” – well – they must not be a Christ follower. What are we wishing someone when we wish them a “Merry’ Christmas? So when I wish for someone to have a Christmas that is full of cheerfulness or laughingly happy – what does that have to do with Jesus Christ? Yes, He does bring joy, but the joy that is the fruit of the Spirit is much more than just being cheerful or lighthearted. Having a sunny, jolly time at Christmas – is that really what Christmas is all about? What about those who are battling sorrow or depression? Does my cheerful “Merry Christmas” really bring Christ closer to them? I seriously doubt it. It probably feels more like a slap in the face. If we really are concerned about keeping Christ in Christmas, perhaps we should be more sensitive to those we meet who are hurting or do not know Jesus Christ as their Savior. Perhaps we should not rush through the line saying “Merry Christmas” and feeling so spiritual. Perhaps we should ask God to make us aware of those we meet that might need a hug, a kind smile and a real message about what Christmas means. So – I’m reposting my article from last year on this controversy. I wondered as she finally walked away in a very self-righteous mood what would Jesus have done in this circumstance. Her attitude was anything but loving and kind. So – I began to wonder: Are we as Christians supposed to be keeping Christ in Christmas? Is that what the birth, death and resurrection of Jesus is all about? A holiday where we spend so much time, energy and money baking, shopping, going to parties, putting up lights, waiting for Santa Claus to come? Please do not misunderstand me. I’m not suggesting these things are wrong – I miss the days when my children tried their best to go to sleep early so Santa Claus would come. The days when we had a big, beautiful tree full of lights in our living room with presents. Christmas is a fun-filled family time I appreciate. But really? When we talk about keeping Christ in Christmas – it seems to me we are making Christmas the big deal. Somehow we need to make sure in all our busyness that we add Christ to this day. So – we add a candle-light service to our list of parties, we put out a manger scene along with the other Christmas decorations and we insist everyone say “Merry Christmas” not “Happy Holidays.” Then, we sit back and feel so righteous because we have fitted Christ into our Christmas routines. The birth of Jesus – and its celebration – is much more than saying “Merry Christmas.” The birth of Jesus shows us God’s love in leaving the glory and splendor of heaven to come to earth as a human. It is a moment to be savored with awe and solemn reflection – not by a hurried “Merry Christmas” as we pass one another in the stores, at church or in our homes. That night so long ago may well have not been a “Silent Night” as we love to think of it. I earlier posted some thoughts on that “Silent Night” image we have of Jesus’ birth. At our church service we recently sang “Away in a Manger.” I was struck again by the words “the cattle are lowing, the baby awakes, but little Lord Jesus no crying He makes.” Really? He came to earth to be one of us – to experience our pain, our sorrow, our fears, our temptations. So – when he awoke in the middle of the night possibly hungry and cold, He did not cry! Christmas is only the beginning of the story of Jesus Christ. There was his earthly life where I believe he experienced sorrow and pain – and I know at least two times when he cried – at the grave of Lazarus and over Jerusalem just before He went to the cross. Somehow I believe he cried as a baby too. There was his time in the garden of Gethsemane when he experienced such agony the Bible tells us he sweated great drops of blood. And, thankfully, there was the resurrection! So – there is so much more to this story of Jesus Christ than His birth. But unfortunately that seems to be the one we want the world to recognize and acknowledge. We don’t seem to care that the celebration of the resurrection is overshadowed by the Easter bunny and the Easter egg hunt. As long as the world says “Merry Christmas” and we keep Christ in the holiday, everything is fine. Well – I think we need to be more concerned that the world knows He not only came as a baby, but He died and rose again. And why? So – we need to begin showing that love to others around us. Jesus said they would know we were His disciples by the love we showed to others. I propose we don’t worry so much about keeping “Christ in Christmas” but rather make sure that our Christmas is in Christ – because He is so much more than the baby in the manger. 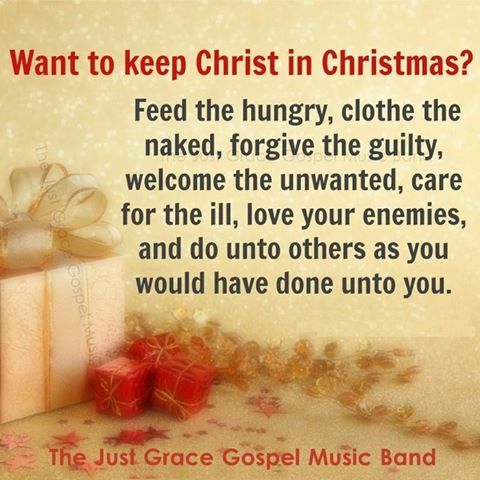 Let’s keep “Christmas in Christ” and make Him known to the world by our love for others.